Discover thirty-eight of the weird and wonderful creatures of Down Under — from the iconic kangaroo to the puzzling echidna; from the tiny crusader bug to the enormous saltwater crocodile; from the adorable quokka to the terrifying Tasmanian devil. Did you know that lyrebirds can mimic almost any sound? Or that an oblong turtle has the longest neck of any turtle in the world? 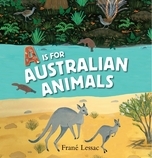 Vibrant paintings and fascinating facts introduce readers to a wide array of incredible animals in this vivid celebration of the fauna that makes Australia unique. There are so many amazing animals to be found in Australia — and many of them are found nowhere else in the world. 48 / 9 13/16" x 10 1/4"